After a long, long hiatus, I started meditating again recently. 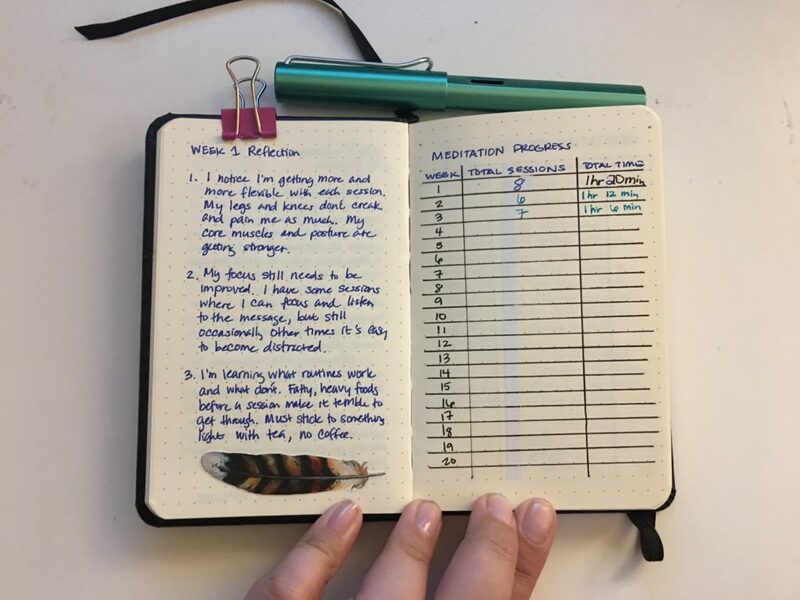 To assist me in my journey, I decided to start a meditation journal because as you also know, I like to document things. So what would incite this reawakening? I think one day I just woke up and realized I had a lot of inner turmoil and chaos in my head and in my heart. The anxiety that I had learned to tame through therapy began to inch its way back into my life little by little and I felt like I was sinking. One of the things my old therapist taught me early in our sessions was self-care. My self-care regimen was comprised of 5 facets: spiritual, social, physical, mental, and emotional. Each day, I had to document one thing I accomplished in each of the 5 facets of self-care and the goal was to accomplish at least 3. If you’re the type who likes to write, internally process, and reflect on things, a meditation journal may be the key to a rewarding meditation practice. Here are a tips for starting your meditation journal. This may be a very general statement but when it comes to journaling, do what inspires you. If you’re already familiar with keeping a journal, you know there are many formats you can follow for your own meditation journal. However, many people believe when you’re trying to establish a new habit like meditation, keeping a journal that you’re inspired to write in will make it easier to keep up with. Here’s my meditation journal. It’s a pocket-sized Rhodia notebook with dot grid Clairfontane paper. This is my first Rhodia notebook and I must admit, I think they may be my favorite now. A peek inside. I decorate each page with a couple stickers and some washi tape just for some visual interest. Sometimes the medium can be the make or break point of whether or not a new habit is successful. 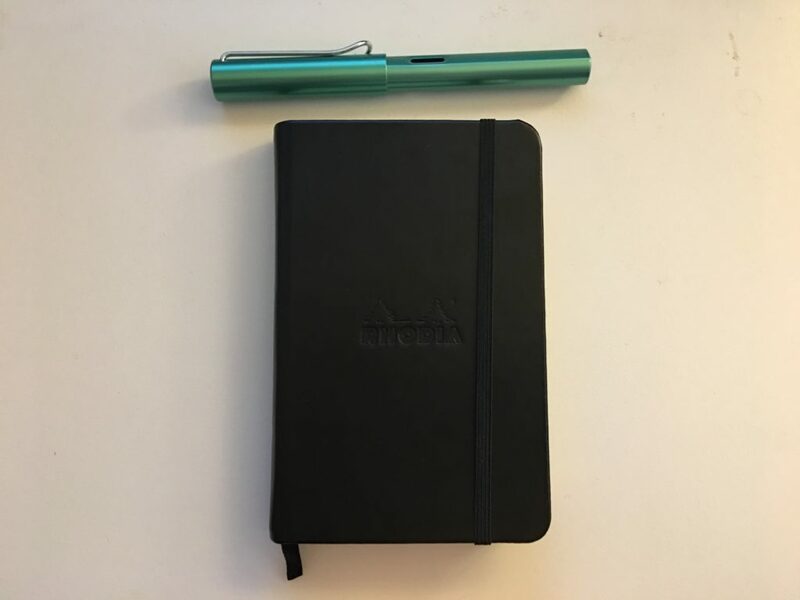 If you believe in the trusty ol’ pen and paper, then maybe a traditional journal like a Moleskine or a Rhodia notebook would be best. However, if you’re the digital type, there are so many digital options out there for tracking your meditation practice. Just be sure that whatever app you choose enables you to track the things that are important to you and will make your meditation practice successful. And sometimes you may need to try both to determine which one is best for you. It’s ok to experiment. What kind of progress do you want to track in your meditation journal? Do you want to track your time? Your sessions? Your emotions and thoughts during each session? I have a chart where I keep some weekly stats. It’s not extensive, but it’s what’s important to me. When I first started my journal, my entries were only 3 or 4 lines long. I noted my posture, how I felt, and the length of each session. Sometimes I would ruminate on why my session turned out the way it did. Like for example, two weeks ago I noted several times that I had several evening sessions, which was unusual for me. When I looked back at my entries, I could see what caused that and how it affected my sessions. Eventually I learned that I wasn’t getting enough sleep at night and I was rushing in the morning and often ran out of time for my morning session. I was even noting the title of the guided meditation I listened to, but after a week or so, I realized that particular bit of information had very little impact on my ultimate goal. Your meditation journal should be a living, breathing organism. It should grow and change with you. Like I mentioned earlier, sometimes you may realize you’re recording information that doesn’t make sense or isn’t as useful as you thought it would be. Sometimes you may want to add things that, while they’re not necessary to your practice, are adjacent to your practice. I got back into mixing my own incense blends so I dedicated a section of my meditation journal to my recipes and notes. I use incense during every session so for me it made sense to include this as a section of my journal. Over time, your meditation journal will become a stockroom of information. But what good would that information be if you didn’t review it every once in a while? You may want to have built-in review periods for your journal, especially in the beginning when you’re first starting your meditation practice. In my case, I would reflect on my entries weekly, and write a few notes of commentary to remember for the following week. These notes can be observations, ideas for improvement, etc. While researching additional ideas for this post, I came across an article by Bodhipaksa at wildmind.org. One of the ideas he brought up was double-entry journaling. In this method you leave every second page blank in your journal – you only write on the right hand page. Then when you do your weekly review of your journal you can make notes on the left hand page. Those notes might include further reflections on some aspect of your experience, or may pick out particularly significant things that you have learned. 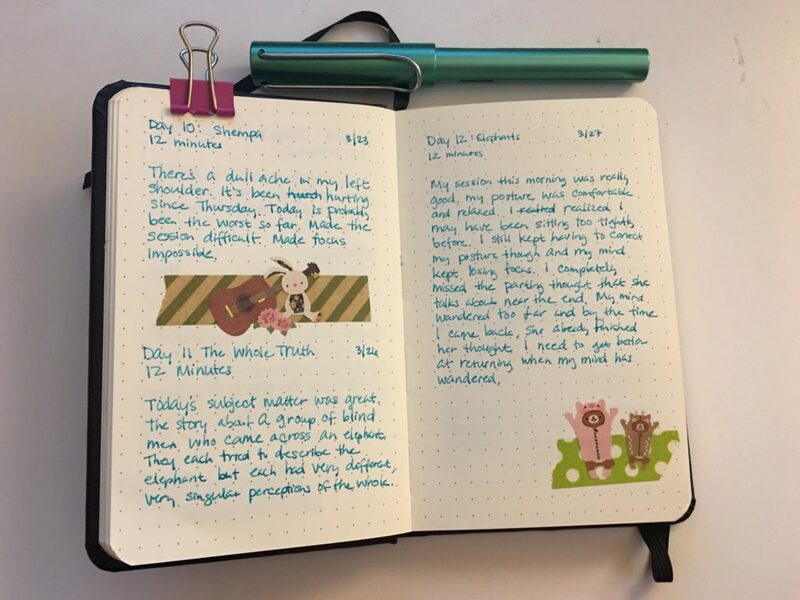 For those who want to get the most out of their journal, double-entry journaling may be the way to go. A meditation journal can be a rewarding accompaniment to your meditation practice. You do need to be careful because you don’t want your journal to be the focus of your sessions. Always remember that the journal is just there to to be a silent observer and should not be the focus. I love this – I just started to learn to meditate and really wanted to journal about it but really didn’t know where to start.. you have given me a place/ideas etc.. thanks so much.. now I have to get a notebook so I can start.